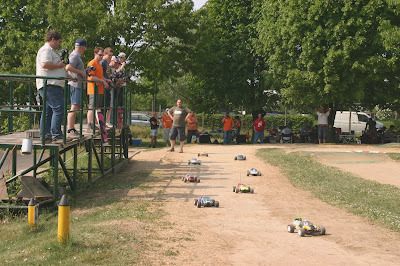 Me and mate Fantuzzi made it to a race event at a local club and tried to compete the modern 2WD monsters with our old HPI RS4 4WD trucks. Even if race management allowed us to start with a not class conform vehicle, not all of the opponents were too impressed. But it was one of the days with a steep learning curve for all participants. Due to excellent wheater it was great fun and kinda 'relaxed' day. In the end I made it to A finals finishing 7th and Fantuzzi came in 9th due to multiple damages and breakdowns in qualifying.